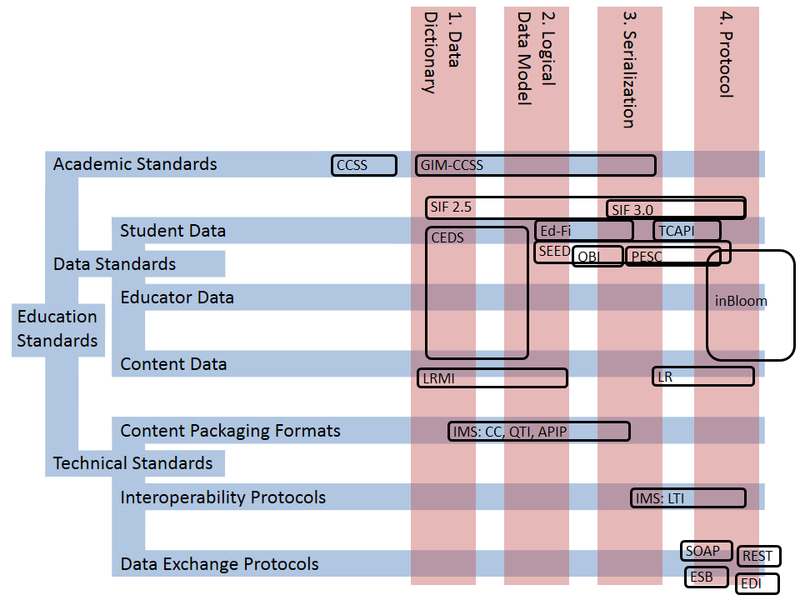 My friends at SETDA have published a new paper, "Transforming Data to Information in Service of Learning". It represents a movement that I favor. Historically, educational data has been used primarily for accountability purposes. But, properly reported, data can guide instruction and learning and personalize the experience. The result is significant improvement to student achievement. To understand the chart better, I recommend reading the descriptions of the two models. The Four-Layer Framework for Data Standards and the Taxonomy of Education Standards. There's a lot of crowding in the area of student data. The standards in this area don't compete as much as it would appear. While there's some overlap, most fill complimentary roles. Details of all of these standards efforts and how they relate to each other are in the SETDA paper. Here are links to the official websites and, in some cases, my writing related to each of the above standards. Like most everything on this blog, these models and this chart are free to reuse under a CC-BY license. I hope they're helpful to your efforts. I was looking for some EDI Solution information and i found your blog. Your blog contain a brief Chronological history of EDI. Keep on posting. EDI systems is now became a very good way to of data exchange. EDI Provider are providing EDI service in very low cost and reduce the use of paper in industries.